Photovoltaic panels convert energy from the sun into free electricity. Photovoltaics (PV), or Solar Electric, work by converting the sun's energy into electricity using roof-mounted panels. Cheaper units convert some 5 per cent of solar energy into electricity and more efficient, and more expensive units, convert up to 18 per cent of energy received into electricity. Power output depends on the type of materials used in construction and the amount of sunlight received. The maximum output from PV systems is in the summer, but the maximum power usage in a property is in mid-winter. Energy from these systems can be sold back to the National Grid. The following are approximations which can be used for preliminary scheme selection. As a general rule a 1kWp photovoltaic array, measuring at least 7.5m2, will generate approximately 750kWh per year in the UK climate. 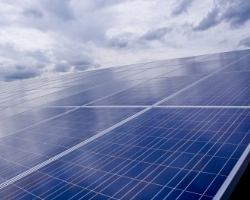 Carbon dioxide savings for 1kWp will be in the order of 480kgCO2 per year. Average power is equal to 20% of peak power, so that each peak kilowatt of solar array output power corresponds to energy production of 4.8 kWh per day (1kWp x 24hours x 20%). Expected annual energy yield (kWh) = Panel Efficiency (%) X Average annual solar radiation (kWh per m²) X Area of panels (m²). The cost of 1kW Mono-crystalline PV solar panels fully installed starts from £7,979. A typical low-energy house will need 3kWp to 4kWp capacity. PV panels output is quoted at 25°C, for every 1°C hotter the operating voltage and power will reduce by about 0.5% & also overall efficiency decreases by up to 1% per year.